If I had a dime for every time somebody has asked me if there's an iPhone app for finding local architecture, I would have a bunch of dimes. I'm glad to say there's finally an app I can point people to. If I had a dime for every time somebody has asked me if there's an iPhone app for finding local architecture, I would have a bunch of dimes. I'm glad to say there's finally an app I can point people to. Our friends at Despark in London have just announced the approval of their (free!) 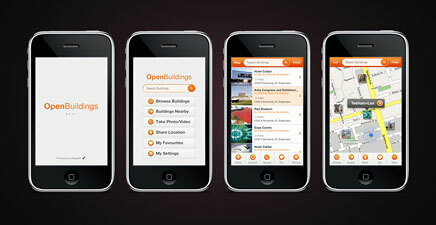 iPhone companion app to their recently launched open-source online building resource OpenBuildings.com. The app is simply titled "Buildings", and after playing around with it for the last week, I've become hooked. I'm finding myself launching the app as I move around Los Angeles to check which buildings surround me. The database is a little sparse for this user's city, at the moment, but the open-source nature of this well-constructed platform will inevitably help fill out the gaps quickly. 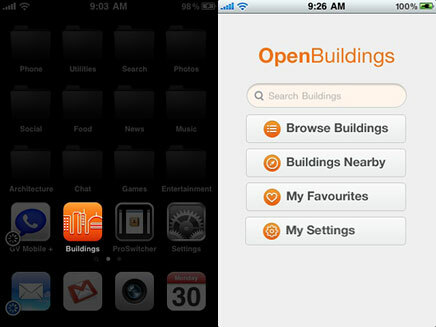 The app loads quickly and immediately prompts the unregistered user to login to OpenBuildings. Once logged in the user is taken to a simple screen providing the option to search for buildings or simply see what is nearby. A project mapping tool visualizes the projects on an interactive Google map. When viewing a project the app uses the iPhone location-detection functionality (GPS and cell-tower triangulation) to identify if the user is nearby. If so, the option to "check in", is made available, similar to apps such as Foursquare, Gowalla and now Facebook Places. The project page is surprisingly content-rich offering building data, articles on the building from other online resources, photos, videos, and comments by other OpenBuildings users. 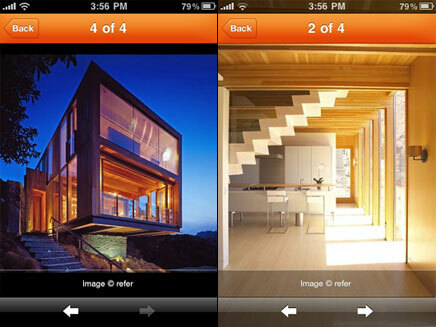 The app also allows the user to quickly add a photo or video from their iPhone's built in camera. The small thumbnail images enlarge to become a familiar iPhone image gallery. The iPhone's built in accelerometer allows the user to turn the phone to the side to view landscape-oriented images in a larger format. 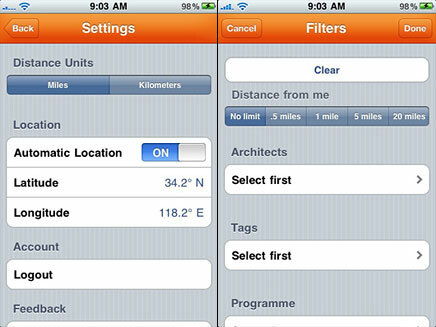 The app offers customization tools for general settings and search filters. 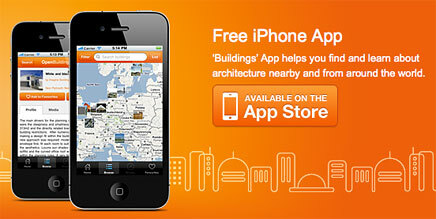 A free new iPhone application that shows architecture from across the globe is now available for download from iTunes. 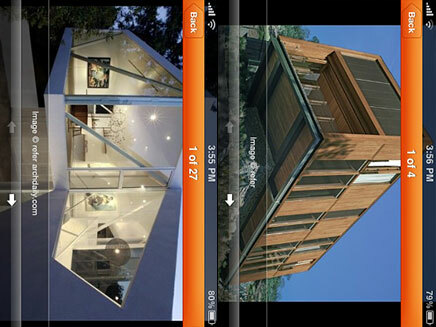 Buildings is an application containing an encyclopaedia of architecture at the user's fingertips. It supplies information, images and videos on over 2500 historic, contemporary and conceptual buildings. 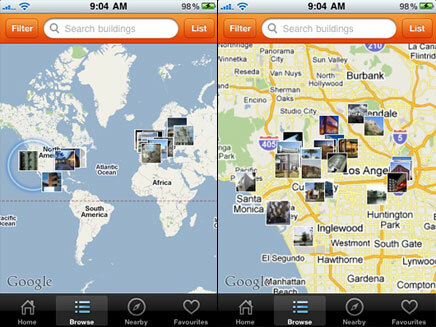 It lets the user find and learn about architecture nearby, across their country or overseas. Using GPS technology to pinpoint the users location, Building is also a perfect mobile guide for travellers who can use their iPhone to find directions to buildings of interest. Architects can upload their own work and other users can also upload their own photos and videos and share with their online community via facebook or twitter. With a rapidly growing, user-generated database of architecture, Buildings offers a rich source of architectural information to professionals, architecture-lovers, tourists & students. The application can be downloaded from the iTunes App store. How long before Droid and Palm users can see a usable version? Apple may be the big kid on the block, but the rest of us want cool toys, too. Paul: thank you for the great review! please get the android version out before mid-november... have a trip to Chicago that I'd love to have this for! yes! as i just got my htc evo, tonight! We'll do our best :)) ... iPad is an interesting platform too ;) ! BTW I'm such a luddite that my own phone only makes phone calls, but I can still see that this is fantastically awesome for everyone else. 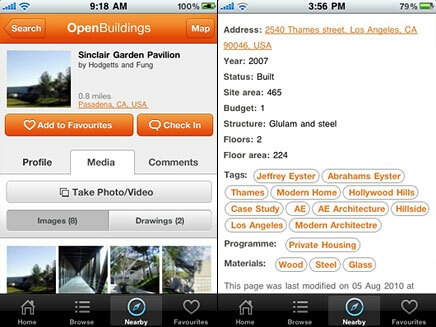 Is there a lists of apps that archinect or others can suggest for architects? perhaps a suggested list can be added to and rated by users overtime can be useful for all of us reading here. thanks.